My running shoes are like Dorothy famous red shoes: they get me home, to myself. 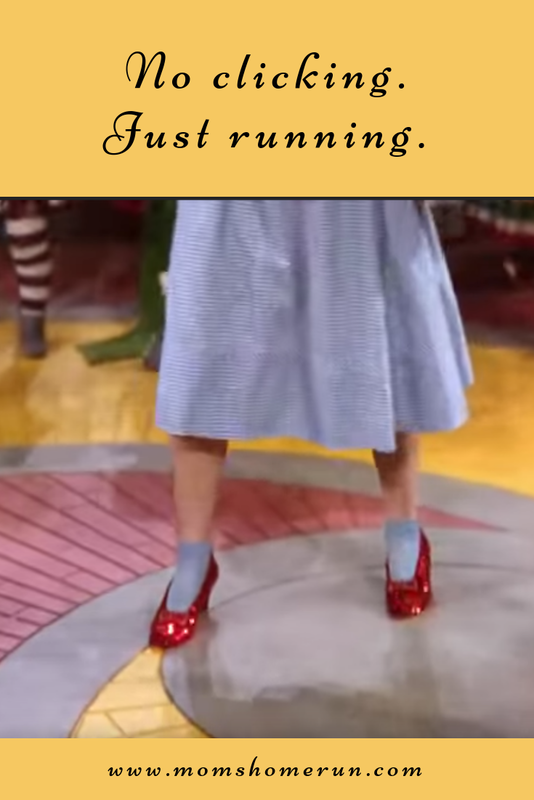 But instead of clicking my heels, I have to run with my shoes. And with every step I take I'm getting closer to the person I am when I'm not a mom, wife, daughter or friend. Granted, I can be a bit of a whiner, but mostly I turn out to be quite good company! The yellow brick road in the movie symbolises our life's journey: getting to know yourself, and becoming who you are. And that's not all that easy! We all lug our bagage around with us, and that doesn't make our journey any easier. So while I'm running I try to get rid off as much bagage as possible. Worries about the children? I throw them between some trees. That stupid fight with my husband about missing socks? I get rid om that on the sidewalk. Slowly but surely I find some peace of mind. In my mind I'm running along the yellow brick road of the movie. And even if I'm really running on a very Dutch bicycle path, or a dirt trail, it doesn't matter. Because they all lead to the same place: home, to me. Just like your running shoes will get you home to you! So put your running shoes on, and follow your own yellow brick road! To get you started, just listen to this song! We all need to run away sometimes, even if only figuratively, but it's good to find the way back to us. So happy you linked up with us at Thursday Favorite Things. What a wonderful way to practice self care! Using your run and fitness journey to also improve your mental outlook in such a positive way is an inspired idea! Thank you for sharing, and for being a part of the Hearth and Soul Link Party. Hope you are having a great weekend! I do love the idea of getting rid of the baggage as you go. In fact it is crucial for a peaceful inner life. I had a nice strenuous walk yesterday and I came home much lighter as I got rid of a lot of baggage on the way.